The sea-floor image this week is one of my favorites that I’ve seen in the published literature. It is from a paper by Saller et al. (2004) called Linked lowstand delta to basin-floor deposition, offshore Indonesia (find out more here). 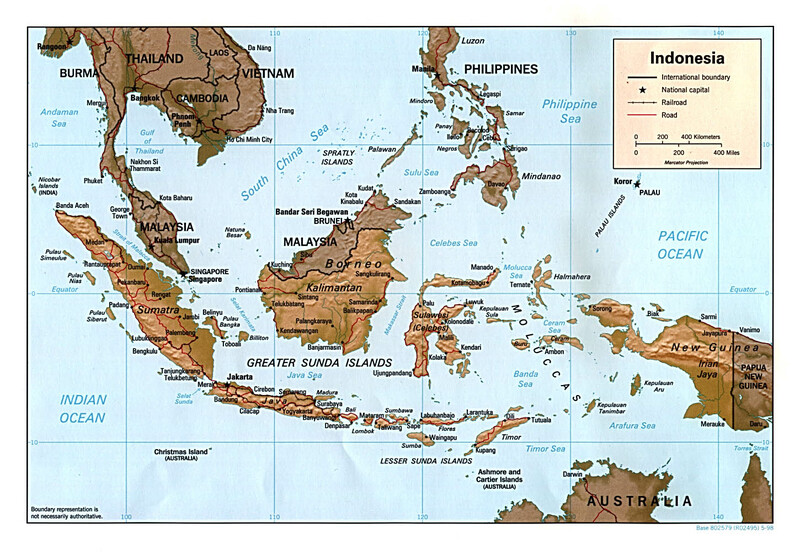 The Makasser Strait is between Kalimantan and Sulawesi in Indonesia. For some regional context, see this map. You definitely should click on this to see the full-res version. To orient you a bit … this is a perspective image looking west at the continental slope. 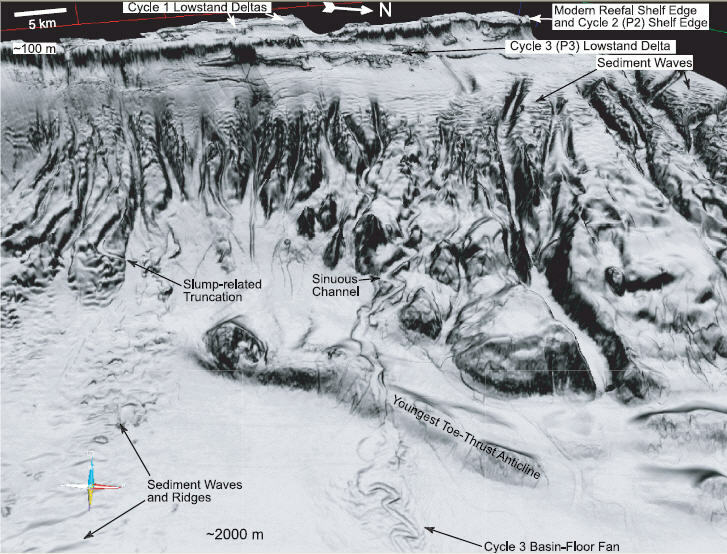 The continental shelf edge of Kalimantan is near the top of the image and the base of the continental slope (~2000 m water depth) is at the bottom of the image. The image itself is a coherency map superimposed on the 3D bathymetry. In this image, the dark areas of the coherency attribute represent steep slopes or chaotic signal. When it is put together and then draped over the bathymetry, this image is similar to a shaded relief map. What you should take away from looking at this image is how complex the continental slope bathymetry is. Gullies, channels, canyons, mass-wasting scars, and other features dominate the slope. This area is very near the Mahakam River delta and thus a supply-dominated slope. That is, there is a great abundance of clastic detritus delivered to the ocean during the last couple million years (at least) — the continental slope is trying to build out into the ocean basin. Here are a couple images zoomed-in. 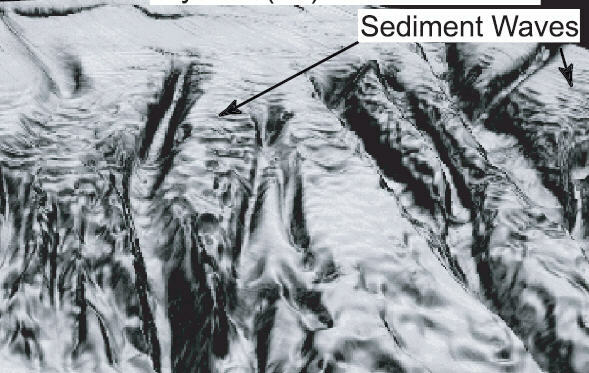 This image (above) is the uppermost slope — the current shelf edge is just off the top of the image. Note the multiple and deep canyons cutting through the upper slope. Sediment waves form as turbidity currents spill out of the canyons. That is, the height of the sediment-laden current is taller than the canyon is deep. We don’t quite understand the formation of sediment waves in great detail, but better imaging and monitoring are helping. I’ll put together a post about the “state of the art” regarding sediment waves another time. The next zoomed-in image (above) is a bit further down the slope. Here, the deep canyons are transitioning to channels. Note the sinuosity of the channel. Another common feature of supply-dominated margins like this are structural features related to large-scale gravity-induced movement. 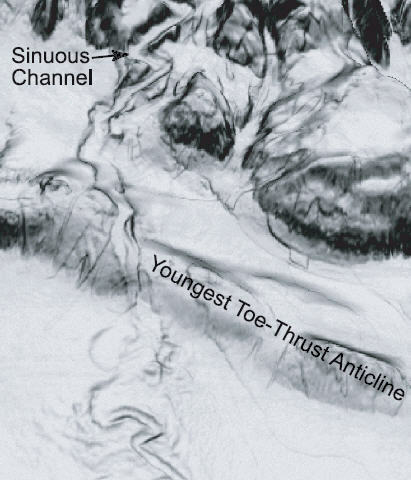 In this case, the toe-thrust anticline represents relatively slow failure of the entire slope — imagine the slope slowly falling towards the deep — you end up with extensional features on the upper slope and compressional features at the base of the slope. Note the margin-parallel trend (roughly) of the strike of the anticlinal features. It gets a bit more complicated since these are long-lived features that grow over time (i.e., they are not the product of a single “event”). What’s cool is that these structures can act as a “backstop” for sedimentation such that “mini-basins” are formed behind them. The mini-basin will eventually fill and then the subsequent gravity flows will find their way to the next lowest spot. This is generally analogous to the mini-basin physiography of the Gulf of Mexico that I showed in this post. Those structures, however, are created by salt movement. The Saller et al. (2004) paper goes into a lot more detail regarding both the features on the modern sea floor as well as the evolution of the shallow subsurface and history of sedimentation on the margin during the Pleistocene sea-level cycles. Do you know much about the regional tectonic environment for this bit of Indonesia, and how that might effect what is going on (aside from lifting up mountains to erode)? No, I don’t in any detail…I’ll try and look a few things up. Thanks again for your informative blog. I note that the heavily-exploited oil center of Balikpapan is right in this area. We seem to have a lot of common interests. For instance, I am intensely opposed to the Law of the Sea Treaty, and had a very long letter opposing it published in the NY Times back in the 90s. I worked on an oil and gas exploration lease sale here (the spring Indonesian licensing round that just closed). We won 2 blocks here.